Il-treatment of BahadhurShah-II by removing his name from coins. After that Lord Canning announced that after Bahadur Shah, the Mughal successors would not be called emperor and their status would be reduced to Prince. The immediate cause of the revolt was introduction of greased cartridges. The new Enfield rifle had been introduced for the first time in the Indian army. Its cartridges had a greased paper cover whose end had to be bitten off before the cartridge was loaded into the rifle. The grease was composed of fat taken from beef and pig. The religious feelings of the Hindu and Muslim sepoys were terribly wounded. The sepoys believed that the government was deliberately trying to destroy their religious and cultural identity. Hence they raised the banner of revolt. AO Hume, a retired civil servant in the British Government took the initiative to form an all-India organization. Thus, the Indian National Congress was founded and its first session was held at Bombay in 1885. On 28 December 1885, the Indian National Congress was founded at Gokuldas Tejpal Sanskrit College in Bombay, with 72 delegates in attendance. The first meeting was originally scheduled for Pune but due to plague outbreak, the venue was shifted to Mumbai. The second session of Indian National Congress met at Calcutta in December 1886 under Dhadabhai Nauroji. Abolition of company rule and provided that India was to be governed directly and in the name of the crown. 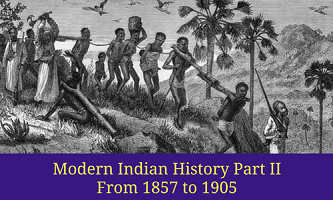 It made a beginning of representative institutions by associating Indians in with the law-making process. The system of decentralization of finance that had begun in the time of Lord Mayo was continued during the time of Lord Lytton. Lord Ripon introduced the Factory Act of 1881 to improve the service condition of the factory workers in India. He instituted a Police Commission in 1902 under the chairmanship of Sir Andrew Frazer. He passed a law called the Ancient Monuments Act, 1904 which made it obligatory on the part of the government and local authorities to preserve the monuments of archaeological importance and their destruction an offence. Curzon brought in the Indian Universities Act of 1904, which brought all the universities in India under the control of the government. 2. Who was the Mughal emperor at the time of 1857 revolt? 3. Who is known as Father of Local government in India? 4. Who was the first secretary of state for India? 6. Which charter act allowed Christian missionaries to preach their religion? 8. Who is the author of “Poverty and Un British rule in India? Explanation: Dhadabhai Naoroji, known as the Grand Old Man of India. His book Poverty and Un-British Rule in India brought attention to the draining of India's wealth into Britain. 9. Who called 1857 revolt as First war of independence? 11. Who was the last governor general of India? 12. On which day Mangal Pandey revolted against British?